Documentary filmmakers and journalists--are you tired of election coverage? Well help us change it. Current TV is trying to change the focus of media coverage to the issues, not the candidates. So we're asking anyone who can to produce a mini-documentary (3-7 minutes long) about a major election issue--healthcare, economy, education, etc. Tell us a fair, accurate story about how one of these issues affects you or your community. If you upload your piece to our website by Dec. 15th, you'll be considered to join the Current TV team at the New Hampshire primaries, as a paid producer on the ground! And Current TV could buy your piece to air on our international cable channel. So get in touch with us at currenttvjournalism@gmail.com and get those cameras rolling!" Here's our latest ratings for Sunday, November 11th, 2007. SMARTCROWD consensus index ratings, based on prices on November 11th, and the relevant spreads (spreads explained) are as follows. We're still kicking around some ideas for new analytics/metrics that measure prediction markets, poll data and news. We hope to release this before year end, assuming we are confident that the outputs add value and increase the breadth, depth and richness of what makes up the SMARTCROWD consensus index. Currently the index is calculated solely from prediction market data. There's been some very significant changes in prediction market ratings since October 7th, when we last reported our ratings. The most significant changes are the extent to which Hillary Clinton has further consolidated her lead, from 65.76% to 72.15%, and the extent to which Fred Thompson has slipped in the prediction market ratings, from 21.84% to 7.49%. Rudy Giuliani and Mitt Romney have improved their ratings from 37.17% to 42.87% and 25.62% to 32.15% respectively. Here's some interesting articles that give a snapshot of what's happening in the nomination races. Our daily newsclip page has a broad list of relevant articles. There was one piece of news from Google that we're very excited about. It looks as if Google may soon aggregate prediction market data in the same way that it augments relevant articles with stock quotes and links. This will be very powerful and will significantly increase the awareness of prediction markets. Go Google! We'll obviously have to start focusing on more meaningful metrics! This will be a great development. Awareness of prediction markets has progressively increased over the past 6-12 months, & especially since elements of established media have started to take interest. Following the CNN/YouTube debate last Monday, the Clinton and Obama camps launched a spat about foreign diplomacy, generating plenty of media coverage. While their respective camps were going at each other, others piled in too, kicking up the dust. 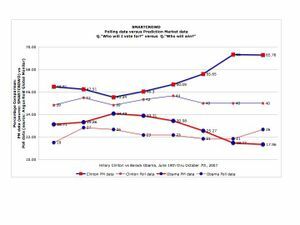 In the prediction markets, Hillary Clinton strengthened her lead with a SMARTCROWD rating (trending up) of 46.3%. See chart, above. 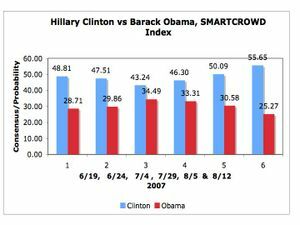 Barack Obama still trails Clinton with a rating of 33.31%, slightly lower than his early-July rating following his stellar fund raising performance. John Edwards' rating remains in single digits. Surprisingly (or was it? ), a lot of fuss was made about a Washington Post article that referred to Hillary's neckline, sending political commentators and the media wading into a "cleavage" debate, generating newsprint, TV and blog coverage around the world. Elsewhere, according to CNN, Newt Gingrich today predicted that Barack Obama would be Hillary Clinton's running mate in '08. Its obviously too early to tell whether this is an insightful prediction, or simply adding political fuel to the fire, or both. But the angle, not surprisingly, is getting coverage 1, 2. Meanwhile, on the GOP side, the Republican nominee race still remains open. According to the prediction markets, Rudy Giuliani leads with a SMARTCROWD rating of 32.52% (trending up), ahead of Fred Thompson at 29.37% (trending down) and Mitt Romney at 21.38% (trendiing up). John McCain again scores just 7.2%. New York Mayor, Michael Bloomberg, continued to downplay suggestions that he will run, yet he still commands a probability rating of 33.4% (trending up) at FT Predict. (Note: we're releasing this article without links (and with apologies), due to a technical hitch. We'll repair these asap, as there's some great content out there!). Barack Obama is making up ground on Hillary Clinton following his outstanding fund raising efforts. Barack Obama raised a stunning $32.5m in the second quarter of this year, considerably more than Hillary Clinton and more than the top two Republicans combined, the Economist reported in its election update "Of cash and crushes". 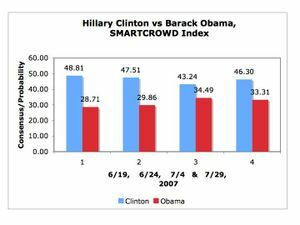 The gap between Hillary and Obama, whose SMARTCROWD ratings are 43.24% (trending down) and 34.49% (trending up) respectively, is now only 8.75 percentage points. See the chart, above right. At Intrade, the gap between the two rivals was just 3.8 points, while at the Iowa Electronic Markets it was 9.1 points. In the GOP nominee markets, John McCain's probability rating continues to wane. McCain's SMARTCROWD rating is now just 7.2%, which compares unfavorably with a rating of 28.57% in mid-May. That's a staggering change in sentiment. CNN reported McCain camp to undergo significant shakeup earlier this week. According to the prediction markets, Fred Thompson and Rudy Guilliani continue to lead the GOP nominee race, with SMARTCROWD ratings of 34.04% and 30.09% respectively. Mitt Romney's equivalent rating is 18.74%. According to FT Predict, the likelihood of Al Gore joining the race is 22% (Gore price chart), while the likelihood of Michael Bloomberg running as an Independent is 40.5% (Bloomberg price chart). 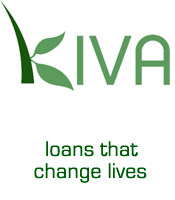 At Inkling Markets, the corresponding prices were 47.3% 11.2% and 11.2% 47.3% respectively*. At Inkling Markets, the Gore price looks to have fallen following reports that Gore (still) has no interest in running. Expect further movements in the markets over the next 12 months as campaigning, ahead of the Democratic and Republican National Conventions, moves into full swing! We've decided to start posting again, after a 6 month break. We're going to be sticking to a similar format <sample>, usually posting once a week or so, on average, for the next 3 to 6 months. Our focus will mostly be on politics, but we may cover some alternative markets. So the first big question, Q1. "should any readers ever really be expected to wait 6 months for the next posting on any site?" A1. No, obviously. Our sincere apologies therefore to one and all, especially if you actually noticed we were gone during this period. Plus, a big "thanks" if you're still reading this, and even more, if you return to read future posts. Q2. Should we always be expected to take such long breaks after any campaign finishes (our last coverage was of the 2006 mid-term elections)? A2. Potentially, yes, though we'll look to keep the time gaps much smaller next time, provided we can find relevant and worthy content. So, what's the real reason for getting back in the saddle...... Three reasons. 1) there's plenty happening in politics right now, especially now the 2008 Election campaign has moved into second gear, with the nominees from both major parties now actively campaigning for their party's Presidential nomination. 2) there's also plenty happening in the prediction markets space more generally (more about this at a later time). For those who want to understand more about prediction markets, there's a great resource at Midas Oracle. 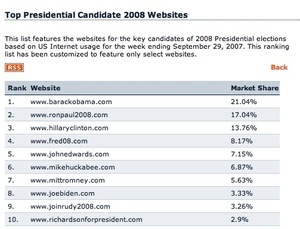 3) it seems the '08 election will really embrace the web and a bunch of related new technologies, even more than before, and vice versa. One small example, candidates are already posting on YouTube! See John Edwards' message for the YouChoose campaign <initial message>, followed by a <random response>, and the subsequent <Edwards' response> adding to this video conversation over the web. 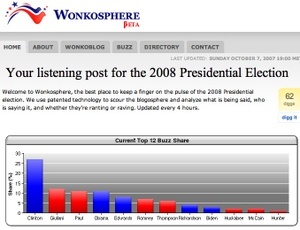 Who knows what role Google and other media and internet companies will play in '08? Its going to be very interesting to watch how it all unfolds through this medium. 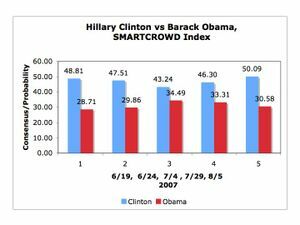 As the campaigns get into full swing, we'll be aiming to report on any significant action in the markets, while simultaneously calculating and publishing the SMARTCROWD Probability Index, as we did in the '06 mid-terms, to give you an aggregate view of the what the different crowds are signalling across some of the more relevant markets. The index will cover Inkling Markets, Newsfutures, WSX, Casual Observer (after it morphs into PredictionXchange) and other major markets like Intrade. We've published our initial Probability Indexes (for April) <click here, if you are linking from an email or feed reader>, covering most of the leading GOP and Democrat nominees. We also have published an index rating for the expected likelihood of a Democratic President, currently at 60% or a Republican President, currently at 40%, following the '08 election. 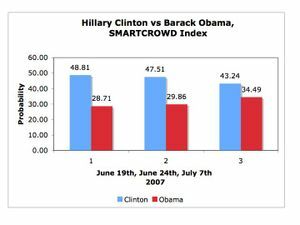 The SMARTCROWD Probability Index, based on a range of prediction markets, recently showed Democratic nominee John Edwards at 13.28%, trailing Barack Obama, at 31.73% and Hillary Clinton, at 40.57%. Look out for more posts in the coming weeks and months. We hope you'll find the data interesting. * excerpted from Wikipedia "Current usage often denotes a collection of dust, usually inside, with little to no traffic by people or animals." Very fitting!